This candelabra represents the wheel of the year with it's (maximum) 13 full moons as an outer ring of white candles and inner ring representing the solar festivals. The festivals are represented thus: Lughnasadh - yellow, Mabon - orange, Samhain - red, Midwinter- black, Imbolg - white, Ostara - purple, Beltaine - blue, Midsummer - green and the Full Moon - the outer ring of white candles. The candelabra was made with a sheet of woven mesh wire brought from a hardware store. 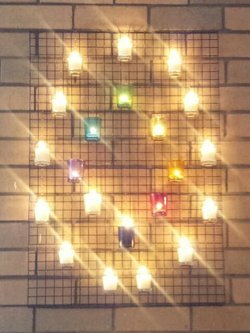 Some wires have been cut and bent to form bases, wile other wires were snipped away to form openings for the colored votive candle holders. Some wires were left in place and use tension to keep the candles holders in place. Make your own wheel of the year candelabra at our workshop. Check the events page for a candleabra making workshop and come and make your own Wheele of the Year Candelabra.